Bring some of this rich underwater nature into your environment with an aquarium and be transported by graceful movement and flamboyant texture. Relax after a hectic day by sitting back on your couch and watching the grace and serenity of swimming fish, or have your morning coffee watching anemones opening to greet the day. Bathe beside a miniature of the Great Barrier Reef or drift asleep watching freshwater fish weaving between soft swaying plants. Custom installation lets you enjoy nature whenever you want. If you are interested in speaking with one of our Aquatic Professionals about installing or maintaining an underwater habitat in your home please complete this form. 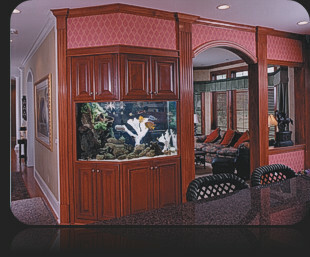 In a business setting an aquarium can accent your taste and values. What your office looks like tells a client a lot about you. So whether you want a traditional look or a contemporary look, let a custom aquarium say something about you while clients are admiring the view. Sometimes the wait for a scheduled appointment can be longer than anticipated. Nothing calms the spirit like the comfort of gazing at a beautiful underwater scene. 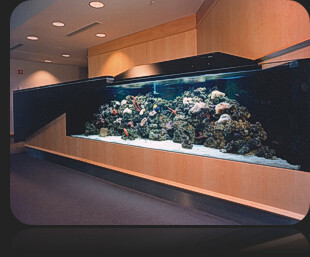 We would love to discuss the many different options for adding an aquarium to your office or workspace. Please complete this form to begin your journey of discovery into the world of living art. 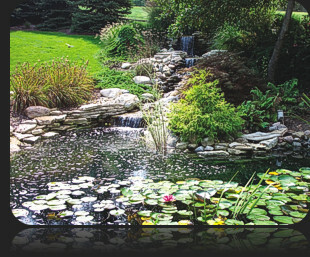 Outdoor garden ponds are becoming the most popular landscape element in America today. Everyone has the ability to create a green space in their own home environment. What makes garden ponds so interesting is the addition of new and different elements to the typical garden. Outdoor gardens consist of an array of beautifully colored flowers, shrubs and bushes. Ponds add patterned stonework, running water, fish to watch and feed, and flowering aquatic plants, attracting frogs, toads, birds and butterflies…Before you know it, it's a nature reserve in your backyard! 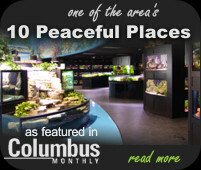 At Aquarium Adventure, we are the pond experts! 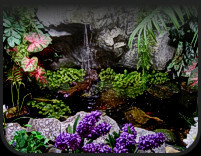 Considered by many to be Pond Headquarters, Aquarium Adventure truly is the place to come for expert advice and assistance in designing and developing your garden pond. Our experts can answer those really tough questions about installing and maintaining garden ponds…a service the hardware stores cannot provide. If you are considering beautifying your outdoor living space please complete this form to contact your closest Aquarium Adventure. 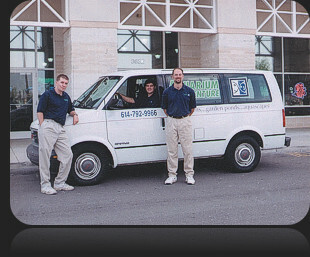 If you are interested in speaking with one of our Aquatic Professionals about maintaining and servicing your current aquarium in your home, workplace or outdoor water feature please complete this form, and we will contact you. Visit our showroom store or call us today to arrange for an FREE on-site consultation.